Yesterday’s post with Adam Lambert’s interview with WBLI left me feeling cold and just plain yucky. The DJs were pretty obnoxious, asking provocative, leading questions with little or no substance. The epitome of sub-gossip junk. Today’s post brings me right back to the Adam Lambert warm and fuzzy side. As a former elementary school teacher, I truly appreciate Adam’s work with the Donor’s Choose charity. Adam had the honor of singing with a group of school children who benefited directly from Donors Choose. For those of you who don’t know about it, Donors Choose is a program that supports music and arts programs in schools across the country. 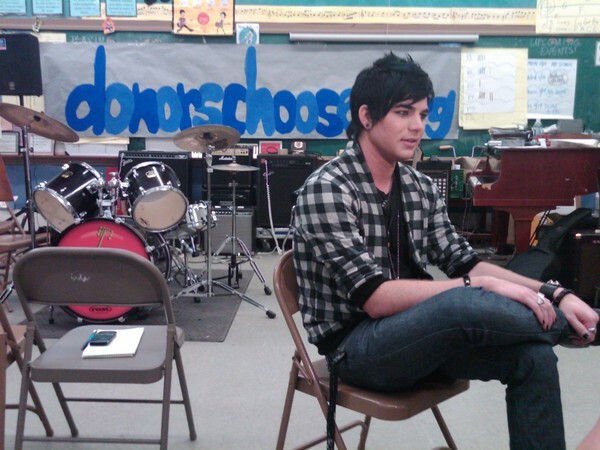 Here’s the link to the web site (this link is always posted on the side of this page as well): http://www.donorschoose.org/adam-lambert. If you can, please donate to this very worthy cause! Here’s a great article from the L.A. Times about Adam’s school visit: http://latimesblogs.latimes.com/americanidoltracker/2010/02/adam-lambert-hand-delivers-supplies-to-needy-school.html. Find the rest at The Lambosessive’s Lair on YouTube at http://www.youtube.com/user/lambosessed#p/u/5/xskttVbH_CU. Check out Adam Lambert in this youtube video thanking his fans for donating to the charity donorschoose.org (http://www.donorschoose.org/adam-lambert). This very worthy cause helps students get the resources they need in support of arts programs throughout the country. Adam Lambert fan groups contributed a whopping $224,000 during this competition. Go Adam, and of course, the wonderful Adam Fans!!! And like Adam says, even though the fan competition is over, you can continue to contribute to this very worthy cause! Adam Lambert fans are the greatest!! Thanks to them, they raised almost $208,000 for music and theater education programs across the country helping over 80,000 students as of Monday, September 21st!! The competition ended on September 20th. ONTD_AI fan club raised the most money so far, with $81,047 donated- WOW! According to Adam on Twitter, we will get the total official results on Wednesday, September 23rd. Congrats to everyone who contributed, and don’t forget this worthy cause in the future http://www.donorschoose.org/adam-lambert (a great holiday gift in honor of Adam, perhaps?? )!